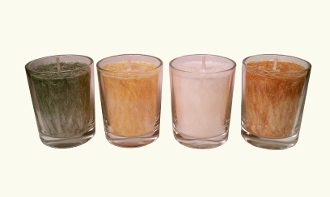 This package includes four handmade Pineapple Coconut Lime palm wax votive candles made in the USA. Included with each candle is a glass votive holder. Palm wax is an all-natural, renewable resource that is obtained from the fruit of palm (Elaeis Guinnesis) trees in Southeast Asia and Central America. After years of testing with various waxes, we ultimately selected palm wax due to its beautiful natural crystallization and scent absorption. Although palm wax is a more expensive and delicate wax, the results are incomparable. We tested numerous essential oils and unique blends prior to creating our signature scents, and each candle holds the maximum capacity of our exclusive fragrances. After careful testing, we chose the finest wicks, color, and production processes to bring you candles of overall superior quality. Fine care is taken in crafting each candle to deliver an exquisite dazzling effect. At Orange Coast Candles we take pride in creating exceptional handmade candles, and we are delighted to share our extraordinary products with you! Candle burn time averages 13-15 hours. May the light of life burn within you! Copyright © 2011-2019 Orange Coast Candles. All rights reserved.